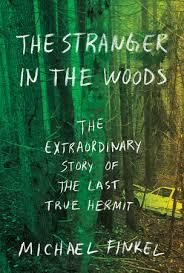 The Stranger in the Woods by Michael Finkel was an interesting book and eminently fast read about Christopher Knight, who spent 27 years living in the Maine wilderness with only two instances of contact with other people. Finkel wrote of how Knight grew up in Maine as part of a family that largely kept to themselves and told Finkel he hadn't fled any bad situation or harbored ill will towards anyone, but just left society. He in 1986 went on a solo road trip to Florida at twenty-years-old, then drove back to Maine, went past his house, left his car with an almost empty gas tank, and walked into the woods. Knight recounted to the author how a few weeks in, he spent one night in an unoccupied cabin, then never slept indoors again, and established camp less than 30 miles from his childhood home. Knight was in a heavily forested area near North Pond lake and accessed his living room sized camp by slipping between large boulders, and survived by pilfering food and other supplies from nearby camps and unoccupied cabins. He said that during the almost three decades there he never lit a fire so as to avoid detection, and wouldn't leave for five or six months during the winter. Everything in Knight’s camp was stolen, including the mattress on box springs and metal bed frame and while there, he would read books, listen to a radio, and just do nothing. In frigid winter stretches he would go to sleep at 7:30, then wake at 2:00 so that he could get his blood flowing and not be asleep for the coldest part of the night. Finkel wrote a bit about hermits and those that have lived apart from society and notes that Knight is perhaps the most solitary known person in all of human history. To this point, it’s stated in the book that Knight recounted how it was solitude he sought, and never felt alone, and his two interactions with other people were a shared hello with a passing hiker in the 1990s, and then two months before his time in the woods ended, stepping out of his camp upon hearing three people hiking just outside the entrance. The hikers later said that they knew they had come across the fabled hermit and thief, but felt he should be left alone, told Knight they wouldn’t report him, and didn’t come forward until after Knight was no longer in the woods. Knight almost certainly would have remained in the camp and continued his lifestyle and practice of stealing what he needed, but was in April 2013 arrested while taking supplies from a summer camp. The Maine game warden who caught him and state trooper who took him in later noted that they believed his story and felt very sympathetic. Knight entered the Maine court system and was treated with leniency, with him pleading guilty to 13 counts of burglary, and not receiving any jail time. He went to live with his elderly mother, whom he noted as not contacting while in the woods to tell her he safe because of his shame about being a hermit and thief, and had to for a period of time either hold a job or go to school and report to a case manager, and appear in court monthly. Finkel wrote a good book, but wraps it up on kind of a melancholy note about Knight becoming compliant and no longer defiant about his life, with him forced back into a society he left behind, and didn’t seem comfortable at all reentering.